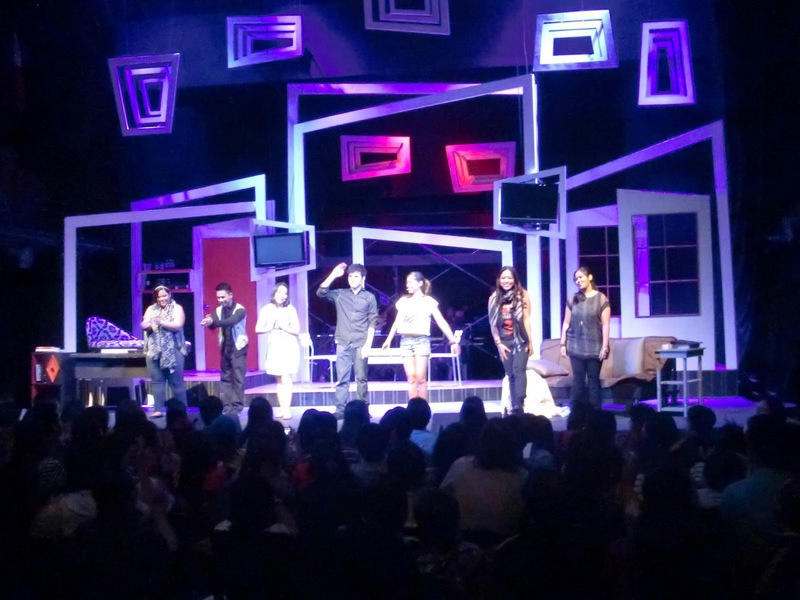 Last Saturday, Nikko and I went to PETA Theater to watch the first show of Sa Wakas. I was invited to the press preview, but I had work and the press preview didn’t have the lead I wanted to watch. Call me shallow, but I wanted to see the production with Fredison Lo so I patiently waited for the Saturday run. 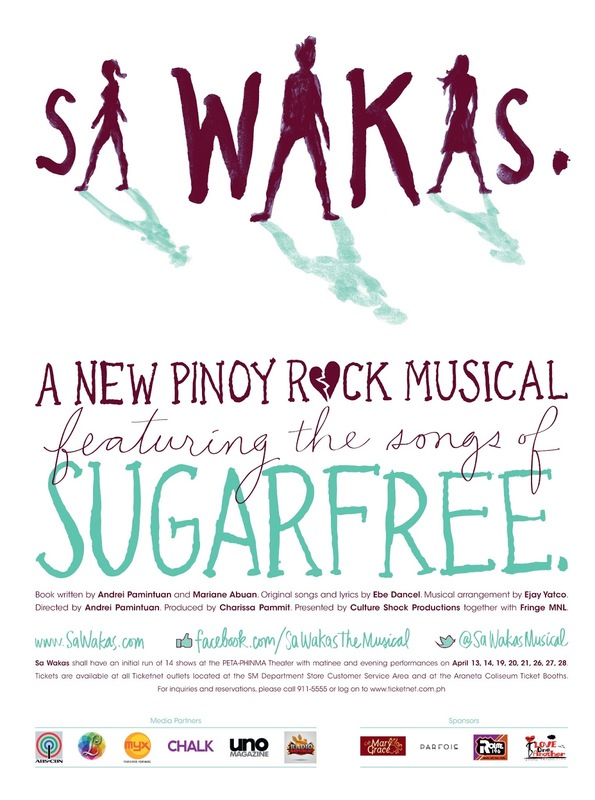 Sa Wakas is a Filipino rock musical featuring Sugarfree’s songs and is about three people caught in the tangle of a disintegrating relationship. It touches on the sensitive topic of cheating, but I liked how tasteful the play tackled it. It had none of the tired cliches those mistress movies of late seemed to bank on. The play revolves around Lexi and Topper, who are engaged. Lexi is a doctor while Topper is an aspiring photographer, and while they may look happy, their relationship is falling apart. Lexi’s busy schedule has made her unavailable, leaving Topper to have an affair with Gabbi, a magazine editor. Sa Wakas is a heartbreaking story of love lost and love found. The musical hit me in a way that no film or play did. I haven’t had a boyfriend in three years so I kind of forgot the feelings one has in a relationship: the joy of finding love, the anger of discovering your partner having an affair, and the pain of being the “third party.” To be honest, I’ve been put in similar situations so I knew what all the characters felt. I enjoyed the play. The acting was sincere, the vocals were strong, and the songs from Sugarfree really hit the spot. But what I liked the most about Sa Wakas was how it humanized the characters. There was a time when we had those mistress movies and TV shows, but they all lacked heart and focused on the controversial casting and campy one-liners. Sa Wakas pushes past these and focused on the meat of the issue: the emotions of everyone involved. When you look at a premise of a kabit story, you wonder: who is at fault? Is it Lexi, whose busy career as a doctor and high ambitions led her to not have time for Topper? Is it Topper, whose needy tendencies and spoiled temperament led him to find an outlet? Or is it Gabbi whose charm and availability (and legs) trapped her and put her in a dead end? The beauty of Sa Wakas is that there is no villain. You can’t pin everything on Gabbi. Let’s face it, kabits are seen as loose women with terrible attitudes. In reality, not all kabits are bad people. Many of them are also victims, quietly hurting while they see their paramours going steady with their ‘legal’ partners. Topper may be at fault. His uncertainty of whether to stay with Lexi or dump her and be with Gabbi has hurt both girls. But the truth is, it’s not his fault. According to one line from the play, “being in between and not having to choose makes perfect sense.” It’s part fear, but mostly confusion. What would you do when you’re in a long-term but disintegrating relationship, then you meet this girl you connect with on a deeper level, who’s supportive of your art and understands you, and who made you realize that your relationship with your girlfriend is not growing anymore? The play can be painful to watch, because all three are hurting. Lexi is hoping for everything to be okay, Topper is stuck and confused, and Gabbi is wondering if she should stay or go. Sa Wakas follows a nonlinear narrative, like (500) Days of Summer. But unlike (500) Days, Sa Wakas has a more bittersweet approach, and the last scene was just perfect. Putting the scene where Topper proposed to Lexi at the happiest point of their relationship as the closing is just heartbreaking, and I was on the verge of tears. Having an affair is a complicated thing. It’s not as simple as people claim to be. You don’t just stop loving your partner even if you have a kabit. You still love that person, but not the same way. It’s not with the same intensity, the same passion. And if you try your best to resuscitate it and nothing happens, it’s okay. The thing is, sometimes things just don’t work out the way we want it to. Sometimes we find happiness in unlikely places. And no matter how much we fight for something we have, sometimes it’s better to cut our losses, accept that things will never be the same, deal with the pain, and move on with our lives. In the end, there is always a new beginning. There are many meanings to sa wakas. Of course, it is the title of Sugarfree’s first album. But if you translate it to English, it would either mean ‘finally’ or ‘the end,’ depending if you’re Lexi or Gabbi.